U.S. Cellular joined the ranks of U.S. carriers with commercial LTE service on Thursday, launching the Samsung Galaxy Tab 10.1 as its first LTE-capable device. The company's initial markets with LTE (Long-Term Evolution) service will be far outside the major metropolitan areas where top-tier carriers such as AT&T and Verizon usually fight it out. Much of southern Maine will get U.S. Cellular's LTE service, along with two small areas of northern Maine, several large cities in Iowa, patches of northern Texas and Oklahoma, parts of Tennessee, and areas of Wisconsin and North Carolina. Coverage maps are available here. About 25 percent of U.S. Cellular's customers are within reach of the LTE network now, and 54 percent will have LTE coverage by year's end, the company said. The carrier says it has 6.1 million subscribers. First up on U.S. Cellular's LTE lineup is the Samsung Galaxy Tab 10.1, with a 10.1-inch widescreen, 1280-by-800-pixel display and 32GB of flash storage. The tablet runs the Android Honeycomb OS on a 1GHz, dual-core Nvidia Tegra 2 processor and has front and rear cameras, the rear unit capable of 720p HD video recording. U.S. Cellular is offering the tablet for US$399.99 after a $100 mail-in rebate in the areas getting LTE coverage this year. Customers elsewhere in the country can buy it for $499.99 after a $100 mail-in rebate. The tablet is on sale in stores and on the carrier's website. In April, U.S. Cellular plans to introduce the Samsung Galaxy S Aviator smartphone, with a 4.3-inch display and Android Gingerbread. Buyers need to get a data plan with the tablet, but existing customers can buy the tablet on a no-contract plan. New customers may need to sign up for a new two-year contract and pay an activation fee, according to U.S. Cellular. The carrier offers two plans for the Galaxy Tab: 200MB of data for $14.99 per month and 5GB for $54.99. Any usage over those limits will cost $0.25 per megabyte, but the carrier won't charge more than $200 in one month at that rate. 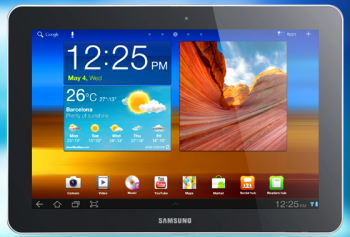 The Galaxy Tab also works on U.S. Cellular's 3G CDMA network, which will let subscribers get the device online before LTE launches in their home cities and when they are outside the carrier's 4G coverage area. By the end of the year, LTE will be available in some cities in Illinois, Maryland, Missouri, New Hampshire, Oregon, Vermont, Virginia, Washington and West Virginia, the company said. U.S. Cellular says users should expect downstream speeds between 3Mbps (bits per second) and 6Mbps, lower than the figures listed for LTE by Verizon Wireless and AT&T. U.S. Cellular has less spectrum to work with than those carriers do, so its network is likely to deliver slower speeds. The carrier is completing its LTE rollout in partnership with King Street Wireless, which owns spectrum licenses in the 700MHz band, prized for its long-distance propagation and ability to penetrate walls. Verizon Wireless launched its first LTE markets in late 2010, and AT&T kicked off its service last September. MetroPCS, much smaller than those carriers, actually beat Verizon to market with LTE when it turned on a network in Las Vegas in September 2010. Sprint Nextel offers 4G WiMax service now through partner Clearwire but plans to launch an LTE network later this year.